Comments: Edwin C. Sexton (Nee: ) | Stockbridge MA United States | 1851-1900 | Comments: *** PLEASE NOTE: Photograph was captured from online auction and I do not have the original, nor any additional information. All identifying and genealogical information was provided by the seller of the photograph. However, in *some* cases I may have done a little research on the name and added it to the comment field also as, "NOTE:", to help researchers with the photograph. *** EDWIN SEXTON: Identified in pencil on back as, "Edwin Sexton 1832." Parents names also mentioned, Edson Sexton and Caroline Carter. Photographer backmark of: Dewey, Pittsfield, Mass. *** (NOTE: With the information given on the photo, it was easy for me to do some quick genealogy research for this young man. His name is shown on various records as, "Edwin C. Sexton" born August 1842 (date on photo appears to be in error)in Stockbridge, Berkshire County, MA. Father, Edson Sexton (born CT, c1801), mother, Caroline (born CT or MA, c1803) A maiden name of Carter is written on photo for his mother. The family later resided in Hampden County, MA by 1870, where Edwin remained during his lifetime. Some of his siblings were, Edward, Egbert, and Charlotte Sexton. 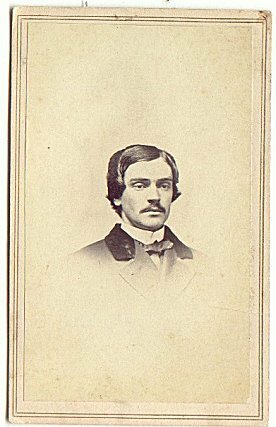 He was in the Civil War, Company A, 20th Infantry Reg., MA, enlisted 1861 and had a disability discharge in 1862. His wife was named Pauline and it appears they never had children. His occupation is shown as a "painter." Edwin is shown as a widower on the 1910 census and *possibly* may have died before 1920.